Shoppers' budgets are stretched tight, and today's food costs are influencing purchasing behaviors. Many believe that it's expensive to eat healthfully. The latest consumer survey polls and expert opinions debunk this myth. Using appropriate shopping recommendations and purchasing strategies, RDs can help clients make healthful food choices regardless of their budgets. This continuing education course identifies and examines trends in food costs and consumer purchasing behaviors and provides recommendations and strategies consumers can use to purchase healthful foods on a tight budget. According to the USDA Economic Research Service, in 2017, the overall cost of food purchased at supermarkets for meals consumed at home is expected to rise 0.5% to 1.5% due to the expectation that severe weather from previous years, such as droughts, will continue to affect food production in the future.4 Over the years, the inconsistent change in food costs has forced consumers to examine their grocery budgets. Higher food bills are changing the way Americans shop for groceries and are causing many shoppers to settle for cheap food at the expense of health and nutrition simply to put food on the table for their families. While healthful foods already may be less expensive than unhealthful foods, food assistance programs, manufacturers, and food delivery services continue to work hard to make healthful foods affordable and easily accessible. For example, in 2013, 18 mayors nationwide pushed for limits on soda and other sugar-sweetened beverages, which comprise 58% of beverages that households receiving SNAP benefits purchase.9 A pilot program in Massachusetts credited SNAP recipients with 30 cents for every dollar spent on fresh fruits and vegetables; this resulted in a 25% increase in the purchase of produce.10 The Double Up Food Bucks program, active in 10 states, matches SNAP recipients up to $20 per day for money spent on fresh produce and credits it to be used on future produce purchases.11 And more and more farmers' markets are accepting SNAP program dollars to address the issue of access to affordable fresh produce. Even though manufacturers of specialty diet and organic products are beset by certification fees and increased labor costs, demand for these products is increasing, and prices are expected to decline accordingly in the upcoming years. Specialty diet products such as gluten-free items, for example, tend to have higher price tags due to the costs associated with avoiding contamination throughout the process from field and manufacturing plant to the grocery store shelf. Moreover, certain alternatives to gluten-containing ingredients (eg, replacing white flour with almond flour) are more expensive, which in turn causes the products to cost two to three times more than their gluten-containing counterparts.12 However, the demand for gluten-free grocery items is projected to increase by 10% annually, and the cost for such products is expected to decrease accordingly.13 Meanwhile, consumers on gluten-free diets can best decrease their grocery bills by choosing naturally gluten-free foods such as fruits, vegetables, lean proteins, and gluten-free whole grains (eg, rice, quinoa, millet, amaranth, buckwheat) as opposed to processed alternatives such as gluten-free bread, muffins, cookies, and tortillas. Consumers looking to purchase organic foods on a tight budget can review the "Dirty Dozen" and "Clean Fifteen" lists on the Environmental Working Group website (http://www.ewg.org/foodnews/summary.php). According to the Environmental Working Group, the Dirty Dozen refers to conventional, nonorganic fruits and vegetables that contain the highest amount of pesticide residues: strawberries, apples, nectarines, peaches, and celery currently round out the top five. Alternatively, produce items on the Clean Fifteen list contain the least amount of pesticides.16 Value shoppers looking for produce with low pesticide residuals should focus their choices on fruits and vegetables on the Clean Fifteen list and consider purchasing organic for those on the Dirty Dozen list. Furthermore, balancing food quality and price for protein and fats also can be challenging when shopping on a budget. Foods recognized as the highest quality (eg, organic, grass-fed, and wild-caught) tend to come with the highest price tags. 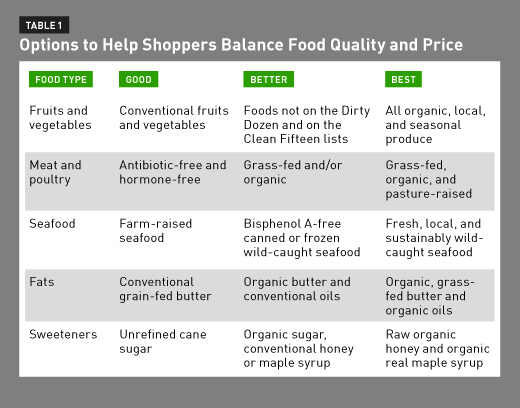 Table 1 outlines the good, better, and best options for such items based on nutrition and sustainability factors to help shoppers balance food quality and price in a way that works with their grocery budgets. When it comes to food choices, the demand for convenience is associated with time, and low-income households may be more pressed for time due to longer shifts and multiple jobs. In 2014, less than 60% of dinners served at home were cooked at home; this is a decrease from the 1980s, when the percentage was closer to 75%.17 This trend is expected to continue, so efforts to boost the healthfulness of the American diet via online grocery shopping and delivery services are focused on promoting the preparation of healthful foods at home while taking into consideration limits on time available for cooking. According to a 2013 survey, nearly one-half of US shoppers (47%) choose to shop online rather than in stores so they can easily compare prices at different retailers.18 Services such as Peapod, AmazonFresh, and FreshDirect enable consumers to purchase groceries online and have them delivered directly to their doorsteps. These online programs help shoppers stick to their lists and avoid impulse buys; they also can review and change their purchases and thus can manipulate their final grocery bill before checking out. But while these services save time, consumers may wonder whether the products are any cheaper. The Wall Street Journal conducted a study to compare prices. Shoppers purchased identical grocery items from a variety of online and brick-and-mortar supermarkets. Results varied by region, but some showed online service, excluding the delivery charge, to be cheaper than the traditional store.19 Delivery charges for these services can range from $6 to $10, with larger orders reflecting a lower delivery cost than smaller orders. Depending on the size of the order and the value placed on convenience, these services may be worth the extra fee. Services delivering healthful meals also are gaining popularity as more Americans strive to eat healthfully while spending less time in the kitchen. While Blue Apron, Plated, and HelloFresh lead the market, competition is slowly increasing and, therefore, prices for meals are expected to decrease. In 2015, MarketWatch conducted a test to compare the cost of ingredients when purchased at Whole Foods Market with those delivered by Blue Apron. The group tested three meals and results showed that two meals were less expensive (by more than $3) when made with ingredients purchased at Whole Foods and one was more expensive by 12 cents.20 While the cost of these services may not always be less expensive when compared with supermarket pricing, the value of meal planning assistance, premeasured ingredients, and portion control can help encourage cooking at home, avoid food waste, and support more healthful food choices long term. A large part of every individual's or family's income is spent on food, and grocery shopping on a tight budget can be challenging. The amount of money a family spends on food each week or month depends on a variety of factors including income and family size. The USDA offers monthly Cost of Food reports that highlight the average expense associated with a nutritious diet at different spending levels (Thrifty, Low-Cost, Moderate-Cost, and Liberal food plans). The January 2016 report showed that the average cost of food on the Thrifty Food Plan, which is the basis for the SNAP allotments, was $85 to $91 per week for a family of two (male and female aged 19 to 70) and $131 to $152 per week for a family of four (male and female aged 19 to 50 with children aged 2 to 11).21 When compared with the Low-Cost, Moderate-Cost, and Liberal food plans for a family of four, which average $182.75, $227.35, and $278.60, respectively, it's obvious that strategic meal planning is key to effectively implementing a nutritious eating plan based on this weekly allotment. Twenty-six percent of Americans regularly go to the grocery store without a list,2 resulting in a high risk of unhealthful impulse purchases and buying more food than needed. The average supermarket layout is carefully engineered to tempt shoppers and encourage impulse purchases, mostly of unhealthful food products (eg, soda and candy at the checkout). The Food Marketing Institute estimates that sales of items displayed in the checkout aisle account for 1% of total sales and 1.3% of store profits.27 Moreover, the average American family of four spends $125 each month on food that's thrown out.28 Encouraging families to develop effective shopping lists with which to implement weekly meal plans will help to encourage more healthful food choices (and fewer impulse buys) and will discourage overbuying and prevent food waste and, therefore, save money in the long run. Whether shoppers opt for a handwritten note or a list created on a mobile device, a detailed list is essential to shopping and eating healthfully on a budget. And the healthful foods that are added to that list don't have to break the bank. RDs can advise their clients about the foods in Table 2, which are good for the body and easy on the wallet. A well-stocked and organized pantry can help save money in the long run for a variety of reasons. First, it encourages cooking at home, which means spending less on dining out. According to the Visa 2015 Lunch Spending Survey, consumers spend an average of $2,746 on lunch yearly—or $53/week.34 Furthermore, those making less money tend to spend more on dining out than do those who make more. Individuals who make less than $25,000 per year spend more per meal, $11.70, than do those in any other income bracket. In contrast, those earning more than $50,000 per year spend an average of $9.60 per meal, a difference of 22%.35 By spending more time cooking at home by way of keeping a pantry stocked with healthful ingredients—rather than relying on prepackaged meals or takeout—consumers have more control over the amount of money spent per meal. Dietitians should encourage clients to keep their cupboards stocked with cooking essentials such as spices, oils, vinegars, beans, lentils, and dry whole grains, as well as canned fish, tomato products, and fruits and vegetables. Furthermore, freezer-friendly items such as frozen fruits, vegetables, and lean meats also have a long freezer shelf life. Buying these pantry staples in bulk when they go on sale can save consumers even more money. Fifty-eight percent of Americans buy grocery items in bulk to save money.2 For items purchased regularly, shoppers should consider purchasing larger packages. A simple scan of the unit price generally shows that items purchased in a larger size or quantity typically cost less per unit than their smaller counterparts. The Understand the Price Tag37 tool at ChooseMyPlate.gov demonstrates the difference between retail price and unit price and provides additional tips for how consumers can use this information to save. While convenience sometimes is worth the extra dollar when time is of the essence, one way to save money at the supermarket is to make simple items at home rather than purchasing the premade versions. Blending simple things such as dressings and spice mixtures from scratch can easily shave off some money from the grocery bill as well as other strategies. Condiments and spice blends that add flavor to meals can add unnecessary dollars to consumer grocery bills. 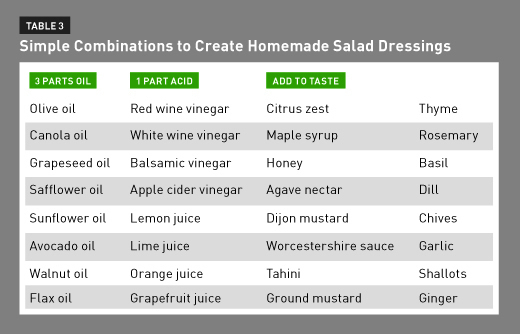 Store-bought salad dressings can cost upwards of $2 to $4 per bottle, and the versatility of one dressing flavor can be limiting, leaving consumers with a fridge full of half-empty containers. The list of ingredients in these items also can include unhealthful added sugar, food colorings, artificial ingredients, and high sodium levels. In addition, the same holds true for many seasoning blends. If your pantry is stocked with a variety of spices, you can mix and match to inexpensively create your own spice blends. For example, Italian Seasoning is simply a blend of oregano, basil, rosemary, thyme, marjoram, and sage. Pumpkin Pie Spice is a mix of cinnamon, nutmeg, ginger, allspice, and cloves. With a well-stocked pantry, it's easy to make homemade dressings and spice blends, which are simple and cost-effective ways to add flavor to salads and meals. Table 3 outlines ways you can advise clients to create unique flavor combinations to fit their cooking needs. One of the simplest ways clients can trim their grocery bills is to switch to generic store-brand products. Selling store-brand items rather than national brands often is more profitable for supermarkets. Therefore, major chains put additional efforts into bringing generics to the marketplace. It's common for store brands to cost 25% to 30% less than their name-brand equivalents. It's been reported store-brand sales at Safeway have been outpacing national brands by a ratio of 3 to 1.38 According to a 2014 study in the Journal of Retailing, sales of store brands have been increasing across the globe over the last two or three decades. In the United States, supermarket sales of store brands increased 5.1% in 2011. By comparison, national brands gained only 2% over the same period. While some may argue that money saved by purchasing generic brands comes at the expense of quality and flavor, recent survey results show an increase (from 57% in 2010 to 64% in 2012) in consumer agreement that brand names aren't necessarily better quality.39 This suggests that the assumption that higher price means better quality is beginning to fade among today's shoppers. For consumers less interested in generic-brand products, using coupons can help them save on everyday name-brand items. Sixty-six percent of US consumers use coupons to save on household items; in 2012, 2.9 billion coupons were redeemed,40 representing a collective $800 million in discounts, according to ILoveCouponMonth.com. From 2008 to 2013, the number of people living in households that used coupons for groceries in the United States grew from 171 million to 181 million, and today the use of coupons accounts for more than $3 billion in transactions. Today's consumers are collecting coupons from the Sunday newspaper, in-store sales flyers, and online resources. In fact, with the modernization of coupon use, mobile coupons are 10 times more likely than traditional coupons to be redeemed.41 The level of coupon use can range from casual to consistent, but regardless, the savings can add up. Buying in bulk can help reduce packaging waste and save consumers money. Bulk inventory bins are becoming increasingly popular at supermarkets nationwide, offering shoppers the opportunity to purchase a wide variety of pantry staples from dried whole grains and beans to nuts, seeds, and spices with minimal packaging. Items sold in bins without packaging offer one step fewer for the manufacturer, thus decreasing the overall cost of the goods. In addition, bulk bins allow consumers to purchase only what's needed at the time (eg, 1 cup or 1 teaspoon), which helps to avoid food waste and shaves money off each grocery bill. According to the Bulk is Green Council, buying foods in bulk can save customers an average of 89%.42 However, prices varied greatly depending on the item; bulk coffee and spices provided the most savings, while nuts and seeds provided the least. Other money-saving tactics include shopping locally and seasonally. Local foods are those that are grown or raised and harvested close to the place of purchase. Due to the short distance that these foods have to travel from farm to supermarket, consumers can benefit from higher-quality foods at a lower cost. The number of farmers' markets nationwide has increased from 1,755 in 1994 to more than 8,000 in 2013 and continues to rise. When asked to rank the top three factors affecting what food and drink they purchased, 15% of people chose "locally produced," stating that they felt local food offered a better value (good price for what you get), lower prices, and reliable products.43 Shopping according to the seasons when it comes to produce also can yield the best-tasting products at a low cost. Resources such as Sustainable Table,44 Eat Wild,45 Local Harvest,46 and the USDA Seasonal Produce Guide47 offer tools to help your clients find local and seasonal food in their areas. Understanding the cost of healthful eating and the barriers that prevent consumers from making healthful choices at the supermarket can help dietitians educate clients on ways to save money while maintaining a nutritious diet. Recognizing efforts being made by food assistance programs, manufacturers, and delivery programs can help RDs reach consumers based on their current lifestyles. And acknowledging popular money-saving strategies both at home and in the supermarket aisles can help dietitians adapt their nutrition messaging to provide maximum impact when it comes to consumer purchasing behaviors on a budget. — Amari Thomsen, MS, RD, LDN, is a Chicago-based freelance food and nutrition writer, former editor of Dietitians in Business and Communications newsletter, recipe developer, and author of Idiot's Guides: Autoimmune Cookbook. 1. Discuss the significance of current food costs and how they influence consumers' food choices. 2. Determine the myths associated with the cost of eating healthfully that affect consumer purchasing decisions. 3. Demonstrate a variety of ways to help consumers modify shopping behaviors to save money when purchasing healthful foods. 1. According to a survey cited in this course, what percentage of Americans believe that grocery items are overpriced and should be cheaper? 2. Which of the following is one of the most important factors that affects the price of food? 3. Based on weight and cost per average portion, fruits and vegetables cost less than foods that should be consumed in moderation. 4. A food assistance program described in this course does which of the following? a. It provides recipients with decreased program dollars. b. It credits recipients who use program dollars on fresh produce. c. It prevents recipients from using program dollars on processed foods. d. It encourages recipients to use program dollars on meal delivery services. 5. Which of the following specialty diet trends is seeing an increase in demand by 10% annually? 6. Which of the following foods is in the top five on the Environmental Working Group's Dirty Dozen list? 7. In January 2016, what was the average weekly cost of food spent by a family of four on the Thrifty Food Plan (the basis for the SNAP allotment)? 8. What is the main reason there are fewer opportunities to cook at home than there were in the 1960s? a. Convenience and delivery/carry-out options are more readily available. b. Time to cook is limited. c. Food deserts are more common. d. Today's consumers don't know how to cook. 9. Based on the 2015 study in the Journal of Nutrition Education and Behavior, consumers using a grocery list were more likely to do which of the following? 10. How much less expensive are store-brand products as compared with their name-brand counterparts? 1. Healthy aspirations: the disconnect between Americans' desire for a healthy lifestyle and actual behavior. Nielsen website. http://www.nielsen.com/us/en/insights/news/2014/healthy-aspirations-the-disconnect-between-americans-desire-for-a-healthy-lifestyle-and-actual-behavior.html. Published August 14, 2014. Accessed February 26, 2016. 2. Synovate survey finds majority of Americans shop with a grocery list. Market Research World website. http://www.marketresearchworld.net/content/view/2809/48/. Updated October 26, 2009. Accessed February 27, 2016. 3. Davidson P. Rising food prices pinching consumers. USA Today. April 16, 2014. http://www.usatoday.com/story/money/business/2014/04/16/cpi-shows-food-prices-rising/7742669/. Accessed February 20, 2016. 4. USDA Economic Research Service. Summary findings: food price outlook, 2016–17. http://www.ers.usda.gov/data-products/food-price-outlook/summary-findings.aspx#foodCPI. Updated September 23, 2016. 5. International Food Information Council Foundation. 2015 Food & Health Survey: what's your health worth? http://www.foodinsight.org/sites/default/files/2015%20Food%20and%20Health%20Survey%20-%20FINAL.pdf. Published 2015. 6. Schnepf R, Congressional Research Service. Consumers and food price inflation. https://www.fas.org/sgp/crs/misc/R40545.pdf. Published September 13, 2013. Accessed February 26, 2016. 7. Carlson A, Frazão E, USDA Economic Research Service. Are healthy foods really more expensive? It depends on how you measure the price. http://www.ers.usda.gov/media/600474/eib96.pdf. Published May 2012. Accessed February 27, 2016. 8. USDA Food and Nutrition Service. Supplemental Nutrition Assistance Program (SNAP). http://www.fns.usda.gov/snap/supplemental-nutrition-assistance-program-snap. Updated August 11, 2016. 9. Black J. SNAP judgment. Slate website. http://www.slate.com/articles/business/moneybox/2013/08/food_stamp_choices_should_people_be_allowed_to_buy_junk_food_with_their.html. Updated August 6, 2013. Accessed February 28, 2016. 10. USDA Food and Nutrition Service. Evaluation of the Healthy Incentives Pilot (HIP): final report. http://www.fns.usda.gov/sites/default/files/HIP-Final.pdf. Published September 2014. Accessed February 28, 2016. 11. Get more fruits & vegetables with your SNAP Bridge Card at select grocery stores. Double Up Food Bucks website. http://www.doubleupfoodbucks.org/how-it-works/grocery-stores/. Updated August 2016. 12. Herrington D. Why is gluten free diet so expensive … and fattening? Real Food for Life website. http://realfoodforlife.com/why-is-a-gluten-free-diet-so-expensive-and-fattening/. Updated March 6, 2014. Accessed February 27, 2016. 13. Gluten-free products market by type (bakery products, pizzas & pastas, cereals & snacks, savories and others), source (oilseeds & pulses, rice & corn, dairy & meat products, and other crops), & by region — global trends & forecast to 2020. Markets and Markets website. http://www.marketsandmarkets.com/Market-Reports/gluten-free-products-market-738.html. Updated September 2015. Accessed February 28, 2016. 14. Ewoldt J. As organic goes mainstream, consumers can expect price breaks. StarTribune. May 11, 2014. http://www.startribune.com/as-organic-goes-mainstream-consumers-may-see-price-breaks/258720931/. Accessed June 14, 2016. 15. Faber S. Demand for organic food growing faster than domestic supply. Bay Journal. March 1, 2006. http://www.bayjournal.com/article/demand_for_organic_food_growing_faster_than_domestic_supply. Accessed February 27, 2016. 16. Executive summary: EWG's 2016 Shoppers' Guide to Pesticides in Produce. Environmental Working Group website. http://www.ewg.org/foodnews/summary.php. Updated 2016. 17. Ferdman RA. The slow death of the home-cooked meal. The Washington Post. March 5, 2015. https://www.washingtonpost.com/news/wonk/wp/2015/03/05/the-slow-death-of-the-home-cooked-meal/. Accessed February 28, 2016. 18. A coupon nation: Americans proudly use coupons more than shoppers in Great Britain, India and China, among others. PR Newswire website. http://www.prnewswire.com/news-releases/a-coupon-nation-americans-proudly-use-coupons-more-than-shoppers-in-great-britain-india-and-china-among-others-220485721.html. Published August 21, 2013. Accessed February 27, 2016. 19. Fowler G. Do online grocers beat supermarkets? The Wall Street Journal. January 7, 2014. http://www.wsj.com/articles/SB10001424052702304617404579304901729135002. Accessed February 27, 2016. 20. French S, Marmor Shaw J. Is this $2 billion meal startup really cheaper than Whole Foods? MarketWatch website. http://www.marketwatch.com/story/how-meal-delivery-can-make-whole-foods-look-cheap-2015-05-27. Published June 25, 2015. Accessed February 27, 2016. 21. USDA. Official USDA food plans: cost of food at home at four levels, U.S. Average, January 2016. http://www.cnpp.usda.gov/sites/default/files/CostofFoodJan2016_0.pdf. Published February 2016. Accessed June 14, 2016. 22. More Americans choosing foods, beverages based on healthfulness. International Food Information Council Foundation website. http://www.foodinsight.org/press-releases/more-americans-choosing-foods-beverages-based-healthfulness. Updated June 26, 2014. Accessed February 28, 2016. 23. Smith LP, Ng SW, Popkin BM. Trends in US home food preparation and consumption: analysis of national nutrition surveys and time use studies from 1965–1966 to 2007–2008. Nutr J. 2013;12:45. 24. Eating at home vs. eating out. 4 compelling reasons to cook your own meals. DailyHealthPost website. http://dailyhealthpost.com/eating-home-vs-eating-out-reasons-cook-own-meals/. Published August 21, 2014. Accessed February 28, 2016. 25. USDA Food and Nutrition Service. What's cooking? USDA mixing bowl. http://www.whatscooking.fns.usda.gov/. Accessed February 27, 2016. 26. Dubowitz T, Cohen DA, Huang CY, Beckman RA, Collins RL. Using a grocery list is associated with a healthier diet and lower BMI among very high-risk adults. J Nutr Educ Behav. 2015;47(3):259-264. 27. Almy J, Wootan MG. The food industry's sneaky strategy for selling more. Center for Science in the Public Interest website. https://cspinet.org/temptation-checkout. Published August 2015. Accessed October 28, 2016. 28. Forty percent of food in America is wasted. Ad Council website. http://savethefood.com/. Updated 2016. 29. Centers for Disease Control and Prevention. Do increased portion sizes affect how much we eat? http://www.cdc.gov/nccdphp/dnpa/nutrition/pdf/portion_size_research.pdf. Updated May 2006. Accessed February 26, 2016. 30. Hook DLB. How portion size adds up to obesity. Everyday Health website. 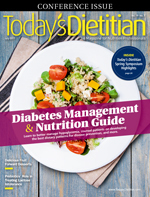 http://www.everydayhealth.com/diet-nutrition/weight-management/big-food-are-we-eating-more.aspx. Updated August 5, 2009. Accessed February 27, 2016. 31. Portion distortion. USDA Choose MyPlate website. https://www.choosemyplate.gov/tools-portion-distortion. Updated October 12, 2016. 32. Portion size. MedlinePlus website. https://www.nlm.nih.gov/medlineplus/ency/patientinstructions/000337.htm. Updated October 28, 2014. Accessed February 27, 2016. 33. Ello-Martin JA, Ledikwe JH, Rolls BJ. The influence of food portion size and energy density on energy intake: implications for weight management. Am J Clin Nutr. 2005;82(1 Suppl):236S-241S. 34. Practical money skills for life: 2015 lunch spending survey. Practical Money Skills website. http://www.practicalmoneyskills.com/downloads/pdfs/Lunch_Spending_Survey_2015.pdf. Accessed February 27, 2016. 35. Touryalai H. Lunchtime: Americans spend nearly $1k annually eating out for lunch. Forbes. September 25, 2013. http://www.forbes.com/sites/halahtouryalai/2013/09/25/lunchtime-americans-spend-nearly-1k-annually-eating-out-for-lunch. Accessed February 27, 2016. 36. Kulp K. Buyers' guide: how to buy in bulk. FOXBusiness website. http://www.foxbusiness.com/features/2012/04/17/buyers-guide-how-to-buy-in-bulk.html. Published April 17, 2012. Accessed February 27, 2016. 37. Understand the price tag. USDA Choose MyPlate website. http://www.choosemyplate.gov/budget-price-tag. Updated June 12, 2015. Accessed February 27, 2016. 38. Tuttle B. Brand names just don't mean as much anymore. Time. November 1, 2012. http://business.time.com/2012/11/01/brand-names-just-dont-mean-as-much-anymore/. Accessed February 26, 2016. 39. Sethuraman R, Gielens K. Determinants of store brand share. J Retail. 2014;90(2):141-153. 40. Number of consumer packaged goods coupons redeemed throughout the United States from 2004 to 2013 (in billions). Statista website. https://www.statista.com/statistics/285775/cpg-coupons-redeemed-throughout-the-us-2004-2012/. Updated 2016. Accessed February 27, 2016. 41. Coupon statistics: general facts about coupons. I Love Coupon Month website. http://www.ilovecouponmonth.com/statistics/. Accessed February 27, 2016. 42. First-of-its kind U.S. study examines the economical and environmental benefits of buying bulk foods. Bulk is Green website. http://www.bulkisgreen.org/blog/?tag=/89%25+cost+savings+to+customers. Updated March 9, 2012. Accessed February 27, 2016. 43. Huber D. 13 new statistics about the local movement food business. Great Harvest Bread blog. https://blog.greatharvest.com/the-bread-business-blog/13-new-statistics-about-the-local-movement-for-food-businesses. Updated June 30, 2014. Accessed February 27, 2016. 44. Seasonal Food Guide. Sustainable Table website. http://www.sustainabletable.org/4529/sustainable-table-s-seasonal-food-guide. Updated 2016. Accessed February 28, 2016. 45. Eatwild's Directory of U.S., Canadian and International Farms & Ranches. Eat Wild website. http://www.eatwild.com/products/. Updated 2015. Accessed February 28, 2016. 46. Local harvest. Local Harvest website. http://www.localharvest.org/. Updated 2016. Accessed February 28, 2016. 47. Seasonal Produce Guide. USDA SNAP-Ed Connection website. https://snaped.fns.usda.gov/nutrition-through-seasons/seasonal-produce. Updated October 21, 2016.